Hotel Midtown offers accommodation which is worth the money in Haridwar. The hotel is just 500 mts away from the Haridwar Railway station and a kilometre away from the famous Har Ki Pauri Shrine. It has been since 1984 Hotel Midtown ( Haridwar ) has been an epitome of comfort, care and consideration for the visitors who arrive as guests. Situated in the heart of the holy city of Haridwar and just off the Delhi Rishikesh Highway. Hotel Midtown is located 500 mts from the Haridwar City Center market, 1 kms from Har ki Pauri and just 500 mts from Railway Station and Bus stand. Rishikesh is just 25 kms, Mussoorie is 90 kms from hotel. 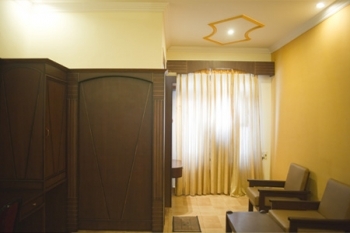 Hotel Midtown have 27 rooms in different category to serve differen tastes and budget of guests. All the rooms are tastefully done to accommodate the guest and provide them the comfortable stay. Flight: Nearest Airport from hotel Midtown is Jolly Grant ( 35 kms) in Dehradun. Train: Haridwar is very well connected by Indian Railways. Rail Distances from Haridwar to Kolkata (1475 kms), Lucknow (500 kms), Mumbai (1650 kms) and Varanasi (900 kms).